For all of those St. Thomas Aquinas students who visited Providence Waterfire this past weekend, stepping into downtown Providence at night almost felt like stepping into another world. The Providence Waterfire set a unique European atmosphere, purposefully reminiscent of city squares and streets in Italy or Spain, in which people gather to enjoy the evening, meet with friends, and relax in the city. This atmosphere is quite a contrast to the usual fast-paced rush we see in most American cities. At sunset, small boats set out to light torches along the river, as well as a ring of waterfire in the wide part of the river just in front of Providence Place Mall. Hundreds of people gathered for the entire night and lined the streets, overhangs, and bridges along the river. Exotic but relaxing music was played for all to hear, and several forms of entertainment were provided in the street fair. Throughout the night people could take gondola rides down the river, complete with an authentically-dressed guide to help row the boats along. Silent street performers posed as gargoyles and statues and interacted with crowds in humorous ways. Yummy snacks were being sold in the streets, such as roasted nuts and candy apples. 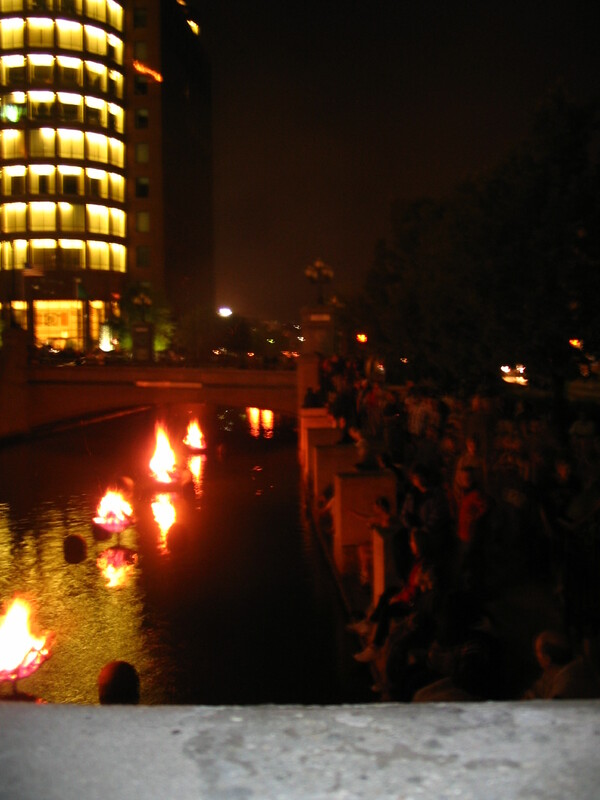 The Waterfire is a wonderful experience no matter what kind of mood you are in: meditative, playful, relaxed, or otherwise. Some people sat along the water and talked with friends, others ate at nearby restaurants with a good view of the water, and still others simply walked around and observed the festivities. Our student group from St. Tom’s met at the Church Center at noon and all 24 of us carpooled to Providence together. The entire day and night was ours to spend as we wished. Most students opted to shop at the gorgeous Providence Place Mall, which is a fun place to walk through and visit even if you don’t much enjoy shopping. 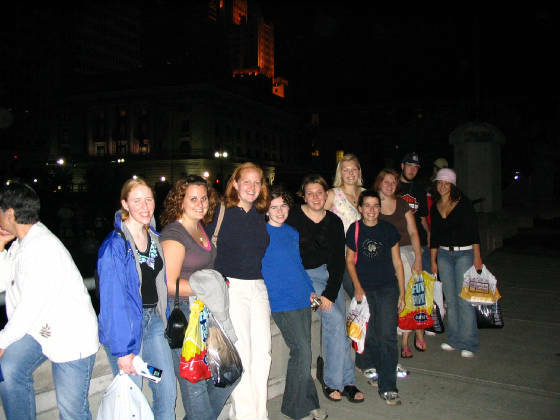 Many students made reservations at restaurants such as Uno’s or the Cheesecake Factory for an early dinner before heading down to the water at night. At the end of the night, several students felt compelled to return to the famous Cheesecake Factory to buy a slice of dessert to take home. The most frustrating part of the night for many was trying to decide which type of cheesecake to pick! 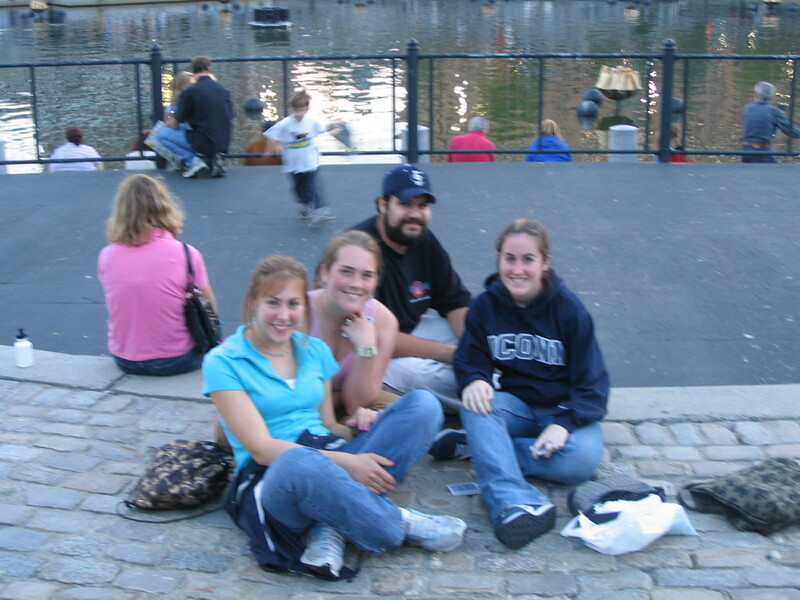 J Saturday at Providence Waterfire was a fun, relaxing night for all. The beautiful fire display on the river and all of the street music and entertainment provided an atmosphere that is sure to keep drawing students back every year. It’s something fun and different to do and you have the entire day to spend however you’d like. It is also an excellent way to get to know other students from the Church. So if you couldn’t make it this year, be sure to keep your ears open for next year’s trip and sign-up! You’ll be glad you did.